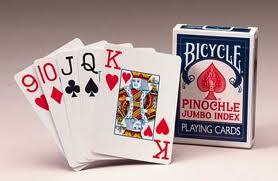 One of my favorite things to do, during my break at work, was to sit at our break room table and play a card game with co-workers, called “pinochle.” It has been awhile since those days, and I do not really remember all of the rules, but I definitely remember the object of the game. The game is played with four people, with teams of two partnering up. With the cards dealt, each team tries to outbid the other team to gain control of the hand, and then it is up to one team, to meet the number of points that were bid, and it is up to the other team to prevent that from happening. Seems like an even challenge, two versus two. It is a relatively easy game to learn, but it can be frustrating for a seasoned card player, accustomed to playing the hands of the game with certain strategies and certain cards being played to either make the bid, or “set” the other team back in points. But there were many times, even after years of playing the game, I would be paired up with someone, who definitely was much better at the game than I was, would make the following comment at me, “playing with you is like playing against three people,” making reference that my plays actually helped the other teams. It was not something I did intentionally. It is just that in this game, and I stress it was just a game, I was not playing to win at all costs, and this frustrated him. I played the game because I enjoyed it. But in life, there is a concept very similar to the comment made by my former co-worker. While not everything in life may not be perfect, or work out perfectly, and those involved in life, and notice, I am not saying the “game of life”, because life is not a game, actually can create the same atmosphere, whether unintentionally or on purpose. There are those that you count on, to work with you, to understand you, to support you, which is not to be confused with “siding with someone,” but when their decisions are made, much like certain moves made in pinochle, it feels like you are taking on more than you thought. Only there is more at stake than bragging rights at a card table.